There are many ways to fill an area with stitching, and each has a distinct look. 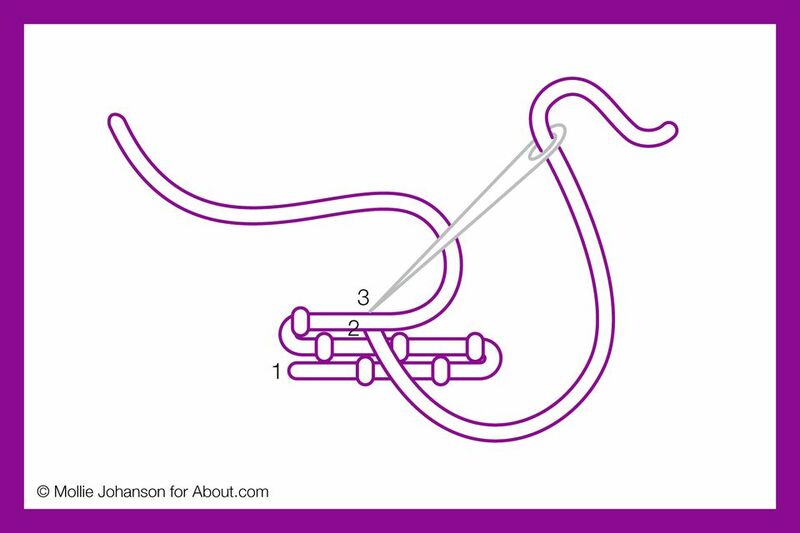 Couching stitch can be used as fill stitching by working it in lines that are close to each other, snaking it back and forth as you tack it down. The result looks very much like basket weave, but don't let that limit how you use this. Especially because you can get a very solid surface in a short amount of time. To work couching as fill stitching, thread two needles with embroidery floss. Bring one of the lengths of floss up through the fabric (point 1) at the corner/end of the area you are filling and keep it on top. This will be the the thread on the surface. Lay the floss along the edge of the fill area and bring the second length of floss up on one side of the surface thread (point 2). Go back down on the other side of the thread (point 3), tacking it down. Continue tacking down the surface thread, spacing the stitches as evenly as possible. When you reach the end of the area, bring the surface thread back so it is next to the first line of floss. Tack down the end of the line. When stitching the second line in place, work the tacking stitches between the tacking stitches from the first row. As you continue, this will create the basket weave look. Continue stitching until the area is filled. When you reach the end of the area or the end of your surface thread, bring the thread down to the back of the work and secure the thread. Because this fill stitch resembles basket weave, I thought it appropriate to stitch a sample in a basket shape. Couching fill would also work well for stitching the roof or brick front on a house or anywhere you want some texture. There are no rules for this! To create the curved shape seen here, the ends of each row extend slightly. If you find that you are having a hard time creating a crisp edge to the embroidery, you can always stitch matching outline with back stitch, stem stitch, or even couching. The example uses six strands and one color for all of the stitching. Even though it is all one color, using many strands for the tacking stitches make the texture of those stitches stand out. Using fewer strands will make the tacking subtler. For more contrast, try working with a second color for the tacking stitches. You can also work a fill area with more than one color for the surface thread. Just change your thread every two rows or so to create stripes, a gradient, or even a rainbow!